WiFi is a wireless networking technology that uses radio waves to provide high-speed internet. This allows you to transfer data, share files, share devices and communicate with other devices without the use of wires. 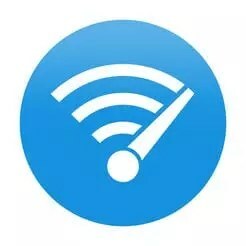 We can also use WiFi to connect to the internet and access various information around the globe. What is the Full Form of WiFi? There is a common misunderstanding among hobbyists, enthusiasts, professionals in this field and even with in Wi-Fi Alliance squad, that the full form of WiFi is “Wireless Fidelity”. Sadly that is not the case. After the brand name was founded, the WiFi alliance used a slogan “The Standard for Wireless Fidelity” for advertising for a short time. This is the culprit behind the mass confusion. This is what added to the misconception that Wireless Fidility is the Full Form of WiFi. Phil Belanger who was one of the co founders of the WiFi Alliance, who presided over the name selection process, stated that – the name WiFi was given by Interbrand as a play on words with HiFi. The truth is Wireless Fidelity is not the Full Form of WiFi and WiFi isn’t short for anything and it never was. It actually has no real meaning nor it has a full form. 802.11a – IEEE expanded on the original 802.11 and created 802.11a. The 802.11a uses frequencies of 5 Ghz and has a maximum speed of 54 Mbps. Since it has a larger frequency, it couldnt cover larger distance. 802.11b – 802.11b was created at the same time as that of 802.11a and It is not the next version of 802.11a. It works on 2.4 Ghz range. It has a maximum speed of 11 Mbps. Because of smaller frequency, it get better range than 802.11a. But the problem is that, there are so many devices like microwave oven, baby monitor, bluetooth devices, that are working on the same frequency that can cause interference with our wifi signals. 802.11n upgrade was made to bring together 802.11g, 802.11b and 802.11a. It can operate at 5 Ghz and/or 2.4 Ghz simultaniously. It can have maximum speed of 450 Mbps. It uses Multiple Input Multiple Output technology. 802.11ac-Operates in 5 Ghz band. It has a denser signalling modulation, which helps us for faster data transmission. It can have maximum speed of Nearly 1300 mbps. A wireless router is a device that is used to provide wireless access to the Internet or a private computer network to wifi enabled devices. Wifi devices can only process one request at a time. So if there are multiple devices using the same wifi connection in a given channel or frequencies, the packets may come at the same time and it may collapse. Or we say that a collision has occurred. WiFi gets around this issue by using a technique called CSMA-CA or carrier sense multiple access with collision avoidance. Here the Access point checks wether the channel is busy before sending a packet. If the channel is not in use, it will send the packets from source to destination. if the channel is busy, the AP waits for a random amount of time before attempting to retransmit again. If node has a packet to send, node senses the channel status. If channel is busy, a back off timer will be started and wait for a random time. After that it senses the channel again. Now if the channel is free, it will send the packet, if not the whole thing will be repeated again. This random time is called back off time. This time is one of the reason slowing down the datarate of the wireless routers. Here is a list of World’s Best WiFi Antennas of 2019. Make sure you grab one of them for High speed, Long Range, and Stable Internet connection. What are the things you should know and keep in mind before purchasing a Home WiFi Router? If you look at the market right now, you can get WiFi Routers for less than 20 dollars all the way a high end Routers for 2000 dollars. So you have a huge range of Home WiFi Routers in the market but what are the things that you should know before buying one? Let us talk about that. The firs thing is, with every WiFi Router, you will find the Ethernet ports. Generally we have 4 Ethernet ports with 100 MBPS Speed which is more than enough for a normal user. But if you are user who transfers lots of Data every day, between multiple WAN/LAN computers, a 1000 MBPS or Gigabit Ethernet port will be better. Also If you have a device like NAS, GigaBit Ethernet port on your Router makes sense. But they are a little bit expensive. Generally the budget routers these days have ‘n’ specification. Only very old routers have the ‘bng’ specification which you could avoid. The basic ‘n’ WiFi Routers commonly known as N150 and which will provide us a speed of 150 MegaBits Per Second. Please note that these are theoretical speed. In reality, this speed will drop around 50%. But If you can chip in a little bit more money, you will get better WiFi Router – N300 WiFi Routers with 300 MBPS Speed. These WiFi Routers employs two antennas and you will get a speed of 300 MBPS. They have better WiFi Signal throughput as well as maximum WiFi Range. Please note that these N150 as well as N300 WiFi Routers runs on 2.4 GHz band. One problem with 2.4 GHz is that, most of the apartments in city areas uses WiFi with 2.4 GHz. Also, various wireless communication technologies such as bluetooth, zigbee and a wide variety of electronic devices uses this frequency for communication. Due to these reason, the 2.4 Ghz band become congested. This could lead to WiFi Signal interference, slow WiFi connection and cause packet drops. Due to this reason, various manufactureres have started building WiFi Routers that works in 5 GHz band. One advantage of using this 5 GHz band is that the WiFi is not congusted because it is fairly new. So even if you neighbours are using WiFi with 2.4 GHz, it wont be a problem for you. But there are some limitations to 5GHz band when compared to that of 2.4 GHz. WiFi Range of 5 GHz band is not as good as 2.4 GHz band. Presently, not all the devices support the 5 GHz band. Also, the cost of 5 GHz router is much more expensive than the 2.4 GHz. 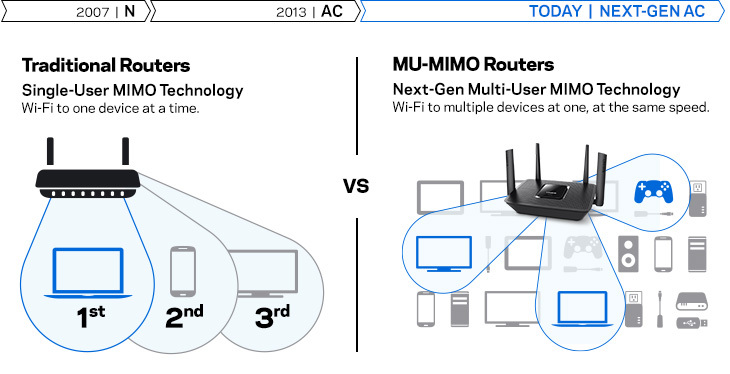 In new WiFi Routers, you have the option of choosing between 2.4 GHz as well as 5 GHz. These device will work on both 2.4 GHz as well as 5 GHz simultaneously. Devices that support only 2.4 GHz will use 2.4 GHz WiFi Signal and high end devices that support 5 GHz will use 5GHz WiFi Signal. 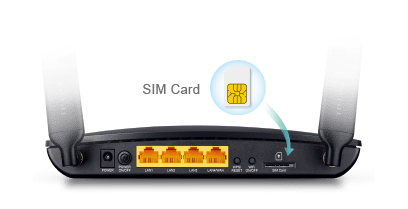 In the case of dual band or tri band routers, even though if one channel is busy with a device, there are other channels available which can send or receive data from other device. that is why dual band and triband WiFi Routers are much faster than single band access points. Some of the recent WiFi Routers have a USB port in the back side of their body. It can have multiple function, for example, the WiFi router will make the data stored inside the USB available across all the devices in the entire network. Basically it can act as a Mini NAS. Some of the routers support streaming features via the attached USB. Some of them even support download manager and torrent client. Using this, you can directly download and save the files in your USB drive or Hard Drive. WiFi Routers these days started supporting 3G/4G Data cards. So if you use a 3G data card and you have a WiFi Router that support the 3G Data, you can insert your data card in your router and share your Data Card internet with the devices that are connected in your WiFi network. In some routers, you will have a primary network and you will be having a provision to setup a secondary network known as the guest network. The advantage of this guest network is that, the devices in the guest WiFi Network wont be having access to the Primary Network. Both of them will be isolated. Now a days, every offices, houses, hotels, parks, hospitals, almost everywhere there is wifi. But the real question is, are they secure?If your wireless access point is not properly secured, people from other houses, offices or nearby buildings can gain access to it. In order prevent these attacks and stop unauthorized access, there are certain security measures adopted. WEP stands for Wired Equivalent Privacy. Main purpoes of WEP was to bring the security of a wired connection to the world of wireless communication. for WEP there are different kinds of encryption available – a 64 bit key or a 128 bit key depending up on the implementation type of your network. But there are some limits for wep. WEP is not recommended for a secure wireless Network. There are so many cryptographic vulnerabilites in encrypting and decrypting the data. The initialization vector that is used in the encryption process, which is supposed to be totally random, is only 24 bits long. The main security risk is that people capturing the encrypted packets , can crack WEP encryption in a matter of minutes. The successor of WEP is something called WPA. WPA stands for Wifi protected access. Here the Initialization vector is longer than that of WEP. Here another method of ciphering the information using the RC4 cipher and an integrity protocol called TKIP of Temporal Key Integrity Protocol is used. Each packet transmitted using TKIP has a unique 48-bit serial number that is incremented every time a new packet is transmitted and used both as the Initialization Vector and part of the key. Putting a sequence number into the key ensures that the key is different for every packet. WPA is backward compatible which means WPA can be used on the same hardware that supported WEP. We just have to upgrade the software for that. WPA2 is the next version of WPA. WPA2 replaced RC4 with a more advanced method of encryption called AES or Advanced Encryption Standard. This also replaced TKIP with another protocol called CCMP which is much more stronger than TKIP and it can make sure that data within the packet is exactly where it came from. WPA2 Enterpirse is the most secure method of Wifi connection. It is done by integrating WPA2 with Radius Server Here, you can use your standard username and password to gain access to you wireless network. During the first month of 2018, WiFi alliance announced their next upgraded version of WiFi WPA security standard – The WPA3, which is expected to be released in 2018. WPA3 will eliminate all of the currently existing security risks and attacks that are a threat to WiFi today; including the Key Reinstallation Attacks (KRACK). WPA3 Security is packed with some of the cutting edge security with cool new features which will provide strong WiFi security as well as better privacy on open WiFi networks. What is WiFi? WiFi Working – Fullform – Routers – Standards Explained Overall rating: 4.5 out of 5 based on 47 reviews.